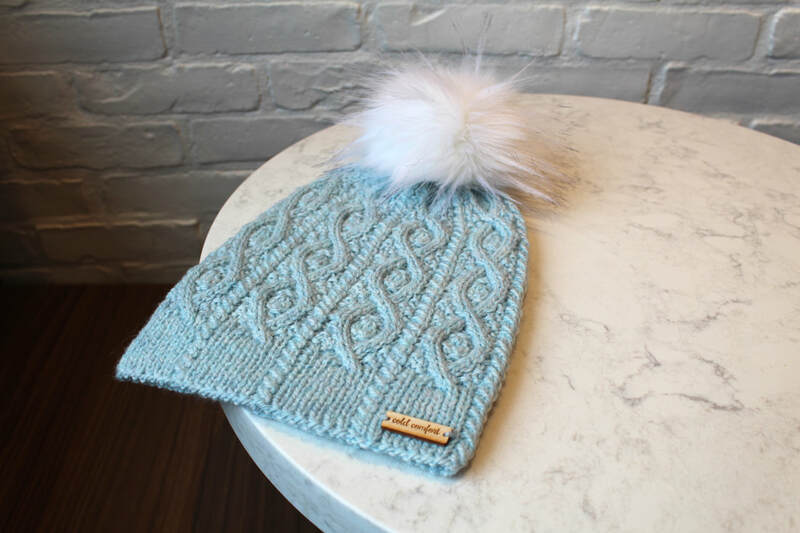 A modern take on a classic, this pretty wool hat features diamond motifs embedded in a richly textured cabled pattern, with columns of crossed stitches that extend into the ribbed band. A great intermediate project, Rachel features a variety of interesting cable and decrease techniques. Knit in a soft, bright colour, it’s a fashionable twist on a winter wardrobe staple. 9.75” (25 cm) length x 8” (20 cm) width / 16” (40 cm) circumference [un-stretched, after blocking]; to fit 22” (56 cm) head circumference—average adult female. Blue Sky Fibers Woolstok (100% Wool; 123 yards [112 meters] / 50 grams): 2 skeins in shade #1318 “Thermal Spring”. Sample used ~ 185 yards / 170 meters / 75 grams. 30 stitches & 28 rounds = 4” (10 cm) in Cable Pattern; un-stretched, after blocking. 1 cable pattern rep of 14 rounds = 2” tall. 1 cable pattern rep of 15 stitches = 2” wide.